Now it wants to reverse that. The company is two years into a 10-year plan to buy $250b more in products from American factories. Bentonville, Arkansas: The group cheer at Wal-Mart’s third annual US manufacturing summit — convened to find more American-made products — was greeted with a voice from another era. “Almost anything can be made by Americans, in this country, and be done efficiently,” founder Sam Walton said in a grainy black-and-white video clip from the 1980s, explaining Wal-Mart’s mission to buy more products at home. Ultimately, Walton failed. American factories that might have fuelled the effort instead closed. Critics blamed Wal-Mart’s insistence on low costs for driving the US supply chain to China, where massive factories and cheap labour overwhelmed American rivals. Now Wal-Mart is trying to revive the US manufacturing base. The company is two years into a 10-year plan to buy $250 billion more in products from American factories. Wal-Mart is hyping its effort, which comes as it struggles with flagging sales and labour strife. Sceptics, citing the company’s history, say it’s just a glitzy public relations stunt. This time, though, the retailer might break though where its founder, who died in 1992, couldn’t. Advances in technology and a rising standard of living (and thus wages) in China help. And just as Wal-Mart originally used its gargantuan scale to send supply chains overseas, it can redirect that purchasing power into hauling them back onshore, while sticking to its everyday-low-prices mantra. But there’s a catch: Manufacturing is different this time around. The same technology that helps factories compete eliminates the need for many workers. So while Wal-Mart could be successful in its bid to bring some production home, it’s going to have to buy a whole lot more in the United States than it ever did before to replace the jobs that already have been lost. Wal-Mart launched its US manufacturing initiative in 2013 and began holding summits where entrepreneurs from across the country could jostle to get their products on to the retailer’s shelves. Last week, nearly 1,000 would-be vendors crowded narrow halls lined with tiny rooms at the company’s low-slung home office, pitching their wares: hand lotions, cooking ingredients, a grill extension used to cook pizza, a T-ball set. In one, a black plastic owl with green-white-painted feathers sat on a table in front of a Wal-Mart buyer. Last year, a lawn and garden company called Dalen had worked with Wal-Mart’s buying team to bring back to the US an owl with a rotating head — the kind used to scare pigeons away — as well as tree stakes it had been producing in China. With a purchase commitment from Walmart, sales and marketing director Nancy Taylor explained, they were able to make them at their factory in Knoxville, Tennessee. This time around, with the glow-in-the-dark owl, Dalen was aiming for a different department: holiday decorations, a sector where almost nothing is made in America. Not every product was something that used to be produced overseas, however, or even something long produced in the United States that had just come to Wal-Mart’s attention. Many of the products on display would appear in the grocery aisles, which the United States already dominates. That’s part of what sets critics on edge: Much of what Wal-Mart is counting toward its $250 billion goal for products “made, grown or assembled” in the United States might have been bought anyway. What’s more, that $250 billion is only about 5 per cent of Wal-Mart’s net sales over the past decade and could be achieved through normal growth. Wal-Mart is still by far the nation’s biggest importer, and a strong proponent of a trade deal with Asia that would allow it to import even more at lower prices. But even if the retailer doesn’t have a massive volume of new US sales, it does have plenty of projects that show what’s possible. Take, for instance, Emilia PC, a cosmetics company that was able to buy a near-death factory in Mississippi and get bank loans to purchase productivity-boosting systems, with the help of a longer-term purchase commitment from Wal-Mart. In some cases, the “Made in USA” product might cost marginally more than the imported one. But usually, Wal-Mart asks the company to stretch and deliver at the lower price. For some products, with smart management, economic fundamentals now support that principle. Energy costs in the United States are at historic lows. Extensive supply chains, with the risk of intellectual-property theft, are now seen as more of a liability than an asset. Smaller, more productive machines are able to churn out inventory closer to the consumer, allowing for faster turnaround times. Average wages in China — which were 17.5 per cent of US wages in 2000 — are now 61 per cent of US wages, according to an analysis by the Boston Consulting Group. And above all, cutting-edge manufacturing technology — in which Wal-Mart has directly invested $10 million in grants — is able to cut out much of the labour that made US production more expensive in the first place, closing the last of that gap. Despite such trends, it’s not easy to rebuild a supplier ecosystem that was dismantled as production moved overseas, making components such as ball bearings and circuit boards nearly impossible to source domestically. 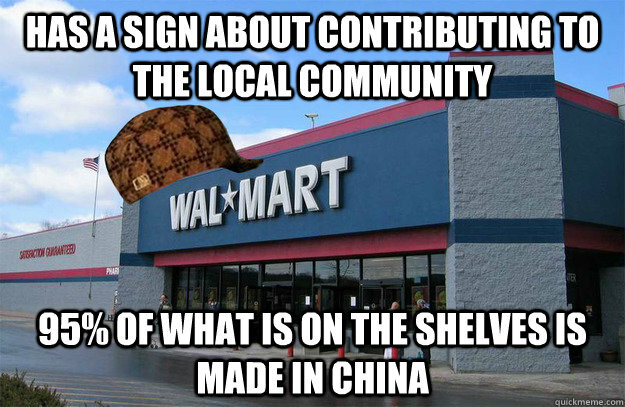 But just as Wal-Mart helped create that problem in the first place, it can use its scale to try to fix it. If factories that produce those little parts do exist, Wal-Mart’s vendors will be able to find them, with free access to a database that shows where suppliers are. Wal-Mart is also helping manufacturers ask states for incentives that can lower the cost of bringing production back. To make the most of whatever preference Americans have for US-made products, Wal-Mart has put everything on a “Made in America” section of its website where suppliers can post videos of how things are produced. It’s enough to give American manufacturing a chance. And it was enough to convince Hal Sirkin, who co-authored a Boston Consulting Group study that made the case for manufacturing’s return in 2011. Wal-Mart called him after that study came out to ask if he could help. After several meetings to assure him that this wasn’t just about image, Sirkin came on as an adviser. Sam Walton couldn’t pull it off, but that shouldn’t count against Wal-Mart, Sirkin thinks.